Are you as shocked and amazed as we are, on finding out that the cost of destination wedding packages in Udaipur can be this low? No, we’re not pulling a late April fool prank on you. We have proof, so you better believe us! Destination weddings cost a bomb! And that’s one of the biggest myths we debunked in the first post of our #DestinationWeddingSeries. Destination wedding is just a fancy name given to marriage celebrations that take place away from home and surprisingly they can sometimes help you save a pretty penny than having a wedding in your hometown. You can read more about this here. Moving on, Capital of the Kingdom of Mewar (one of the oldest surviving dynasties in the world), Udaipur is a city where rustic meets contemporary and serves as an inspirational backdrop for many a painters and poets. Hence, this city of lakes, lavish palaces and fabulous temples has earned the tag of being one of the most romantic spot in the continent of India, eventually making it the most sought after destination for couples looking to celebrate their union in some serious royal style. Wasting not a second more, we’ve done all the leg work in bringing to you, these exotic locations in Udaipur where you can host a royal wedding within the range of 20 to 30 lakhs easily accommodating 150 guests. Take a look! Set amidst the gorgeous Aravalli Range, The Royal Retreat Spa & Resort is a sweet escape from all the hustle and bustle of the city. Strategically located in Badi, Rajasthan, this resort helps you have a grand wedding affair like you’ve never imagined. With close proximities to the all transport hubs, you can rest assured your guests will have no trouble reaching this majestic spot. Each space of this venue is artistically designed in-sync with the beautiful surroundings. The venue offers multiple banquet halls and a grand lawn at your disposal to host a royal themed wedding. Their professional staff is always around to assist you should you need anything. Their events team ensures your pre-wedding and wedding function runs smoothly. Keeping up with the latest trends in weddings, they can skilfully setup the latest themes and customise a catering menu as per your liking. Ramada Spa & Resort in Udaipur offers an architecture that is hard to find anywhere in Rajasthan. If you’re looking for a destination wedding venue that is an amalgamation of traditional architecture and modern facilities, Ramada is your ultimate choice. Courtyards, verandahs and terraces make up for its spatial external elements, while their guest rooms are located around the central courtyard and 3 different lawn areas, ensuring guests receive nothing but a spectacular view from every room. The venue houses 72 guest rooms, poolside dining, 2 banquet halls for grand weddings and exclusive dining venues. Another gem location spotted at the picturesque Aravalli Mountains is The Udai Bagh Resort that is simply extravagant and promises to be much more than a luxurious resort. A perfectly manicured lush lawn surrounded by spacious elegant rooms awaits you at this marvel venue. Located at a convenient distance from the airport and the city centre, makes Udai Bagh Resort an ideal destination wedding venue. Each of its 42 rooms is designed in traditional heritage style and has a spacious balcony that gives you a scenic view of the Aravalli ranges. If you’re looking to save on transportation cost, United-21 Lake City Resort located bang opposite the airport is your ideal choice for a destination wedding in Udaipur. This architectural beauty is popular amongst outstation guests not just for its close proximity to the airport, but also the class service you receive from its helpful professional staff. Along with beautiful mountain view, what welcomes you at this venue is the traditional interiors, variety of banqueting space, plush lawns and terraces that make you feel so fresh. United-21 Lake City Resort is known for its delectable meals and leaves no stone unturned to make your destination wedding a magical, royal affair. Looking for a heritage palace in Udaipur for a wedding on a budget? Chunda Palace is at your rescue. 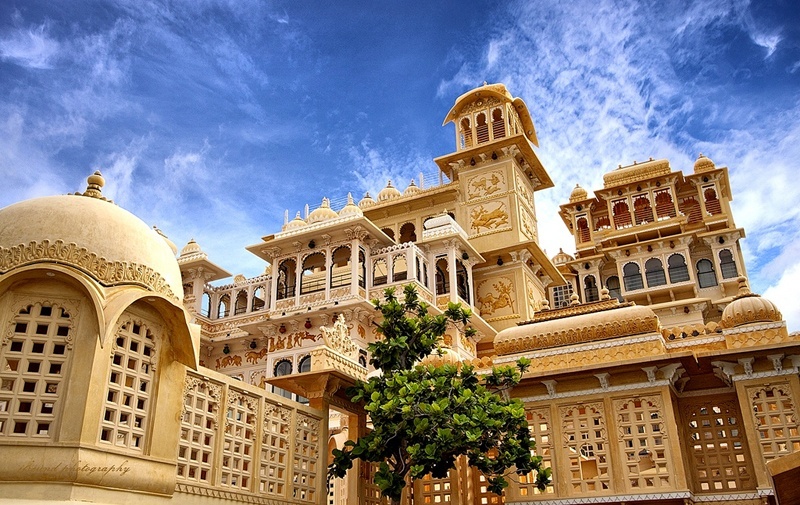 Chunda Palace is a traditional Rajasthani palace that beautifully highlights the rich heritage of the Mewar region. Interiors of the palace include hand painted walls, intricate paintings made using natural colours, bone inlay art work, crafted artefacts and ceilings filled with rich artwork of the region. Hosting a royal wedding at a destination so regal, doesn’t get better than this. Your theme décor, catering, music, as well as recreation requirements all are addressed with keen eye to detail by their hospitable staff. To find out what the set up and vendor cost includes, scroll to the bottom of the blog post. Set on the banks of Fateh Sagar Lake, Radisson Blu offers a breathtaking view of ancient palaces and historic monuments of Udaipur. The venue offers multiple banqueting spaces to host your pre-wedding and wedding festivities that you will be spoilt for choice. A royal touch is given to all its amenities that make hosting a wedding at Radisson a lavish affair. Each room of this resort features a rich heritage infused with modern décor, just the kind you would want to make your outstation guests feel welcomed. Another plus point of this venue is their culinary experts who spread out the most delicious multi-cuisine as well as local Rajasthani gourmet. If looking for an option that’s not a resort, a heritage site or a palace, we have a mind-blowing destination wedding venue that is perfect for a couple having a wedding on a budget. Hotel Valley View has amazing banquet hall options and a sprawling lawn that is at your disposal to host a wedding affair of your choice. Since the venue is located on the airport road, it helps you save more on transportation. However, you need not compromise on ambiance; the hotel offers a marvellous view of the mountains and structural landscapes. Looking for a destination wedding venue that gives you a panoramic view of the beautiful city of Udaipur? Hotel Lakend located at the shore of Fateh Sagar Lake is one the most serene and majestic wedding venue you can book to host your grand style wedding. Along with multiple banquet halls and an open-air space to offer, this hotel’s catering services is considered to be best in the country. Seems like you’ve found your match! For when two is better than one, these combination packages let you accommodate your guest in two different venues, while one of the 2 locations is where all the wedding festivities take place. The Kumbha Baug is a stunning hill-top resort a perfect location for you to host a luxurious and romantic destination wedding. The resort is built to look like a heritage site, but doesn’t fail to offer service that’s par excellence just the kind you would expect in a palace venue. The landscape design of this venue in true sense depicts the east meets west concept with traditional materials and motifs superbly infused with contemporary design. Though this venue offers only 30 rooms, your adventurous kind of guests can be easily accommodated in the Kumbalgarh Safari Camp, which offers 20 luxurious tented cottages that is elegantly furnished with modern amenities. These destination wedding packages in Udaipur are exclusively available with Weddingz.in. Write to us content@weddingz.in with any related concerns or queries or contact us from any city on 77-66 77 88 99. We’ll be back with more such exciting destination wedding packages in #DestinationWeddingSeries. Stay Tuned.